Touching the screen as instructed didn’t this customer. 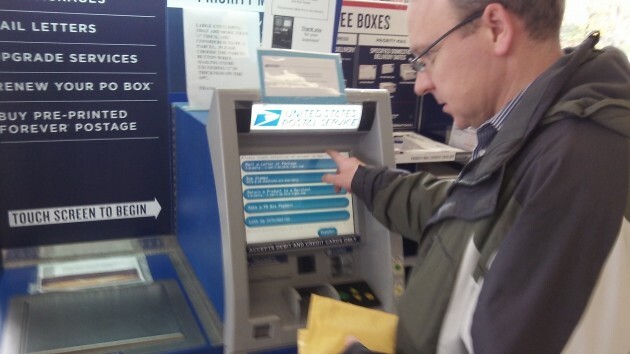 As far as computer-operated machines are concerned, the mail kiosk at the Albany Post Office seems to be overwhelmed or on the blink more often than one would expect in this digital age. I’ve had occasion to point this out before, but the glitches seem to recur or persist. When it is working, the kiosk is a great help. I have been impressed, for example, by the system’s ability to identify a particular address in a town across the country if you supply only the ZIP code and the first letter of the street. That amazing ability was not, alas, on display on Monday afternoon. Instead, the screen told customers that “I cannot help you at the moment,” or words to that effect. Maybe Monday afternoon is a bad time at post offices nationwide. Maybe customers were demanding service from every automated kiosk from sea to shining sea, all at the same time, causing the system to crash. Too bad. Because in Albany the line of people having postal business of one kind or another stretched out the lobby door. 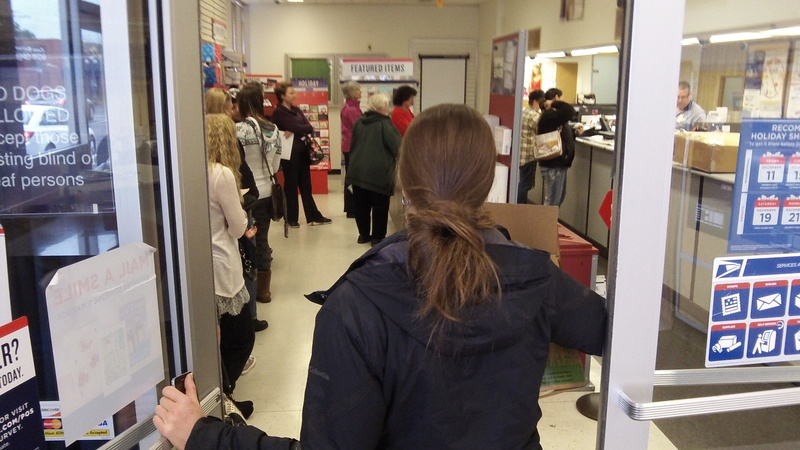 Long line at the post office Monday while the automated kiosk didn’t work. I was shocked to see that no one from the “take our country back-get the government out of our lives” crowd had yet responded to your post office piece. In America, we take systems and infrastructure so much for granted, when it doesn’t function perfectly we balk, not realizing how fortunate we are. I spend half the year in another country, Mexico. It is a wonderful country populated with amazingly loving people, but with a dysfunctional government. The post office is so poor, no one dares use it, including the electric company that delivers the bill by hand to every household. The water coming into the house in unfit to drink. The fire department in a city of 750,000 is all volunteer using ancient firetrucks mostly donated by Canada. The police can be bribed for a traffic stop, because they get paid so poorly, and the roads absolutely destroy your car. I love Mexico, but accept the fact that it is not the U.S. When we cross the border on our way home, I always give a sigh of relief, knowing that if I had an accident, an ambulance…or a life-flight helicopter would be there soon…and glad to be back where almost all things work almost all the time. The non-operational postal kiosk is a symptom of fed. government inaction. The two inner doors have been banging into one another for over a year–simple mechanical fix. When someone mangled our neighborhood mail box we were told no more deliveries until fixed and they would not give a time when it would be fixed–sorry you’ll just have to come to the post office for your mail. I got my tools–hammered it into shape and riveted back together–told PO folks it was fixed and they resumed delivery. On the old Seinfeld show Kramer decided to stop using the post office. So Newman (a postal employee) asked him what he will do about his bills, cards, and letters. Kramer made a good point in a humorous way. For everyday needs, there are now lots of alternatives to the post office. And 99% of what comes in my mailbox ends up in the recycle bin. This kiosk would have made a great prop for Kramer, however. It’s too bad the show ended in 1998. All the jibes aside, as i mentioned in a HH blog some months ago the USPS has “contracted” out all but mail handling/delivery services. So, when the lobby machine breaks down a work order has to go to the contractor in Portland who puts it on his “ho-hum” list & we wait. Even the cleaning of the place, fixing stuck doors, changing light bulbs all has been contracted. Glad to see the nattering naysayers of negativism are still there. They must must get up later than me…or maybe it is the time difference. Actually folks, the last time I ordered something online, it was sent to Albany via Fed-ex or United Postal Service who then handed it off to be delivered to my home in Albany via the good ole’ U.S. postal service. Thank you Ben Franklin… and the functioning U.S. infrastructure. Forty two cents or whatever is is these days, it the best bargain going as far as i am concerned. Kudos to those whom through rain and snow and sleet deliver the mail…and the clean water…and the electricity…and the law and order…and the clean air…and the…well you get the point. And equally dishonest is creating a caricature of somebody’s views, then criticizing the caricature. If your intent is to stifle dissent, there are more effective ways to do it.